This week we said goodbye to a very important and loved member of our family. Viki wasn't just a livestock guardian, she was our family guardian. She loved us as much as we loved her and took her job very seriously round the clock. Four years ago, we met her and brought her home from the spring picnic. Being a teenager Pyr, when she came to us, we had some challenging moments but we pulled through with support from your team. We are now very experience Pyr owners, now, to say the least. 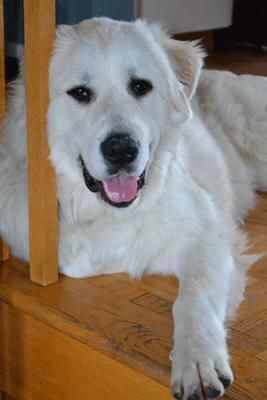 She brought us much joy and was a true Pyr. She continued to want to keep to routine and even hobbled with her child to the bus after being diagnosed with bone cancer. It broke our hearts to tell her she shouldn't do that any more as really she ccouldn't walk that far and had gotten worse daily. She told us she is ready now. Nature told us, too. Coyotes sensed her weakness, and were, for the first time ever, coming up to the house. We want to thank each one of you for all you do on a daily basis tending to these gentle giants. They deserve to live their lives doing what they were meant to do and loving it fiercely for as long as they can. We will bring another into our lives. We believe it greatly helps fill that empty spot in our hearts. I don't know about a Rainbow Bridge for Miss Viki though, she will be hilltop, digging herself a cool mud hole spa. If you remember, at the picnic in a sea of elegant majestic looking, snow white Pyrs, Miss Viki was the one galloping past looking for the first mud hole she could find, only to return to the pack covered in dirt with sticks stuck in her velcro tail. She lived and loved every day just like that. Vicki is a pretty and vivacious 11 month old girl who is a bit of a special needs dog. She loves to run with the other dogs, playing chase in turn. It is rather difficult for her to come down to the “moderate exercise” level that is advisable. Vicki would do well in a calm home where she can continue to evolve into the good companion that she shows aptitude for. She likes human company and walks and petting. She is learning the social graces such as correctly walking on a leash but she does get excited and jumps for joy when we spend time together. Well, she is an adolescent after all but she is learning. She wants badly to have her own special human. Something happened to her when she was little, running and playing with a child, and she started limping. The people brought her back because they didn’t want to deal with this. Over the last few months, with supplements, cartrophen and metacalm, she has responded well and only favours the left hind leg occasionally which stops with some metacalm. Since she is young, she is responding very well. Vicki only asks to be able to “hang out” with a human who will be her own. Thank you Baloo and Family. I was so sorry to read about Vickie passing. She was a beautiful girl. I admit, as soon as I read the beginning of the post the first image that flashed in my mind was the picnic and her body half covered in mud. Sending you all love & hugs from Baloo's family. 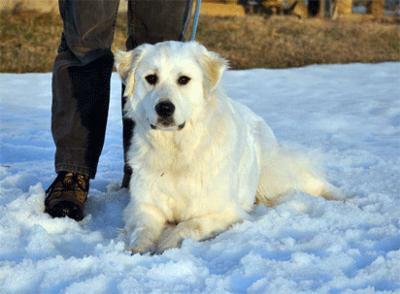 It was great to hear that there are other Pyrs so close to home! We are close to Tottenham...you may have heard the barking from there. Hopefully we can come for a visit when you are working in the store. Wonderful, or a wonderful coincidence! That is the greatest news ever. I wonder if you all can make a party of it. I'm looking forward to hearing more about the three, and if they train their humans properly. I just got the good news last night that Donna, Vicki's new Mom, lives right near here in Bradford! Now Baloo has two rescue Pyrs in town with him, Constance and Vicki! So good to hear such a great story in Happy Tails...and of course if you check out the Facebook page there are photos of Vicki at the picnic...before and AFTER she found the mud hole! Hi, I am the foster mom to Vickie. She is now 1 year old. She lives with 3 other Pyrs and loves to go on long (off leash) walks and is now swimming almost every day and plays with the 5 kids next door. She is very strong now and is off Medicam. Vickie gets along with every dog we meet. She is ready for her forever home. She is living just West of Barrie. Ont. I am willing to answer your questions. I sent out e-mails but have not had answers. Please e-mail me at the contact page. I would like to hear more about Miss Vicki/Victoire! Would she do well in a home with a cat, another pyr, and a small dog? How would she be in a busy home with lots of bi-peds (humans)? Is the Metacam for her hip or knee joint? I wish I could take her..but not possible at the time...I pray someone will give her a forever home and all the love she deserves...she is a sweet beauty. My heart goes out to all Pyrs in need of a loving forever home. I wish I could have them all.